On Friday 9 January the Centre was delighted to welcome to Heriot Watt Prof Ikuo Yamamoto from Nagasaki University Graduate School of Engineering. Some 40 plus attendees learned of highlights from his research career in Marine Robotics in Japan, including service with Mitsubishi Engineeing. 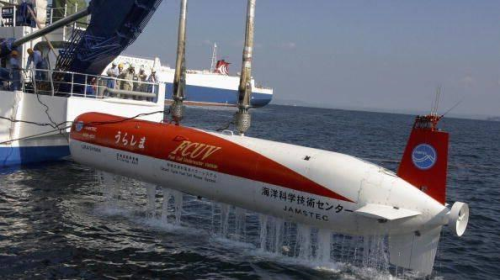 Following some introductory material on control systems and navigation, the 2005 world record breaking at-sea trials of the AUV Urashima were illustrated. http://www.jamstec.go.jp/e/about/equipment/ships/urashima.html The vehicle successfully completed a dive of 317km in February, performing survey operations in the sea of Japan. The talk further highlighted developments in the design and implementation of various fin like biomimetic propulsors. Although theoretical analysis using navier-stokes equations and computational fluid dynamics gives good indications on fin dimensions and stiffness, the ultimately successful designs benefited from practical prototyping and alterations. These have been used to realize lifelike robotic versions of several fish and marine mammals, including carp, ray, shark and not least Dolphin. 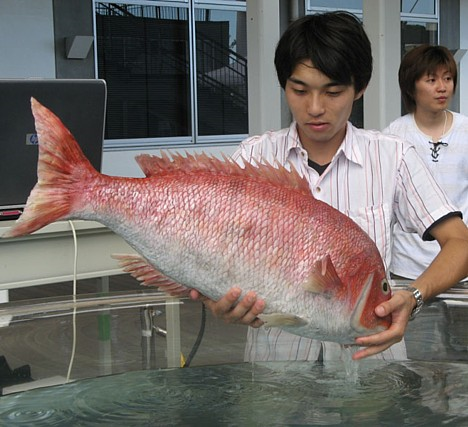 http://pinktentacle.com/2008/07/robot-sea-bream/ From this work he illustrated how a robotic space fish operated in the International Space Station in 2009. Prof Yamamoto was visiting the University and the Centre as part of a memorandum of understanding with Nagasaki University to establish greater collaborative links in the area of marine renewable energy robots. We look forward to welcoming him back in the future.